Updated Wednesday December 20, 2017 by AUBL Miami. The Boca Red Sox beat Team Puerto Rico in a walk off thriller 8-7 last weekend after routing The North Miami Orioles 8-1 in round 1. The Coral Gables A's narrowly escaped with a 9-8 victory over Public Safety Blue last weekend and a 1-0 victory in 12 innings over The south Broward Mets in round 1. The Coral Gables A's are the reigning champs. The A's are well respected nationwide as one of the top tournament teams in the country. This team is built with pitching, defense and timely hitting. Alex Arteaga and Willy Mizrahi are 2 of the top pitchers in the league as a 1-2 punch. Sheehan Planas-Arteaga leads the team in hitting (.600 AVG, 2 HR, 11 RBI). The A's also added former league MVP, former homerun champion and 3 time league champion Yerandy Martinez this season. It will be difficult to unseat the A's as champs. Boer Miami has been a perennial power in AUBL Miami for several seasons. Having been league runner-up twice, Manager Silvio Silva Jr hopes this will be their 1st championship season. Boer Miami always boasts one of the top pitching staffs in the league. Several former Boer players are currently playing professionally. Guillermo Moscoso and Horatio Acosta pitched for Colombia in the World Baseball Classic. MVP candidate Yuniel Cabrera has been dominant (.639 AVG, 3 HR, 16 RBI). Boer Miami has been one of the hottest teams in league, after a very slow start. After defeating Miami New Realty 10-6 and The West Kendall Nationals 6-4, Boer Miami looks to return to the AUBL Miami finals for the 3rd time in the last 4 seasons. 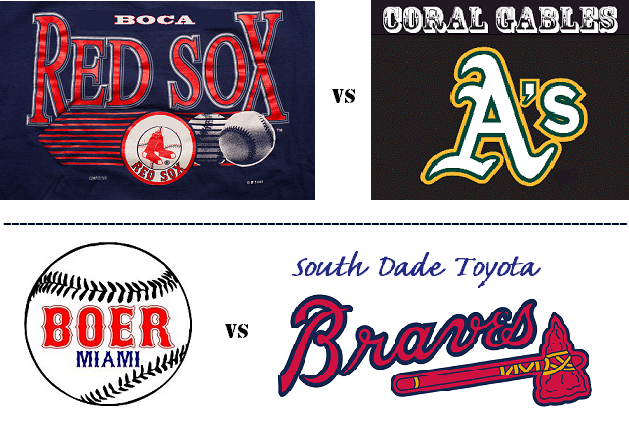 The South Dade Toyota Braves have never been to the AUBL Miami Championship Series, but are poised to give Boer Miami a great game this weekend. the Braves went undefeated this season and have a very deep roster. The braves defeated former champions Dade Diamondbacks with an impressive 7-1 performance after defeating The Dade Vipers 1-0 in round 1.